One problem with investing in small cap trackers1 is that there is no consistent definition of small. Like ancient market traders before the invention of scales and Trading Standards, some people’s idea of small turns out to be quite big. The FTSE SmallCap Index – the bottom 2% (i.e the smallest 2%) of the UK market. The Numis Smaller Companies Index – the bottom 10% of the UK market. The MSCI UK Small Cap Index – the bottom 14%. The FTSE 250 Index – the 16% (or so) slice that sits below the FTSE 100 and above the FTSE SmallCap. The disparities in size can be enormous. The largest firm in the FTSE 250 is worth £4,047 million while in contrast the big kahuna of the FTSE SmallCap weighs a mere £591 million. Theoretically, the weenier the firms held by your index tracker, the more likely it is to benefit from a small cap boost – due to the size premium. But you won’t find a tracker that follows the FTSE SmallCap, the FTSE Fledgling, or even the Numis index. That leaves you to fish about in the active fund murk, or to compare trackers that take their lead from the beefier FTSE 250 or MSCI Small Cap indices. Compare the tracker’s Average Market Cap figure (see the red circle on the pic) versus its rivals to understand which product packs the most pygmies. The smaller the market cap, the better. The Market Capitalisation section (green circle) gives you further insight into how the fund’s holdings breakdown into large, medium, and small cap firms. 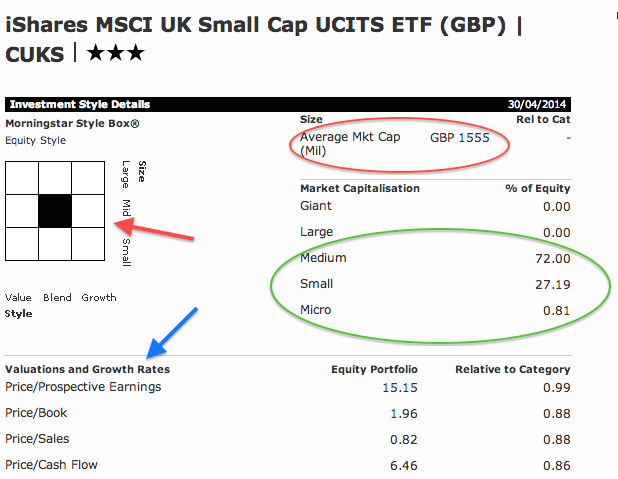 Note, in this instance iShares MSCI UK Small Cap ETF is only 28% invested in firms that Morningstar actually rates as small cap or below. As such the Morningstar Style Box (red arrow) rates the ‘small cap’ tracker as a mid cap product. That’s because it follows the MSCI UK Small Cap Index, which smells a lot like the FTSE 250. The final section that’s worth a shufty is Valuations and Growth Rates (blue arrow). These metrics offer a small but smeary window into the fundamentals of the equities held. The lower the numbers, the more the tracker tilts towards the value premium. If the numbers are low enough then the product would register a hit in the left hand column of the style box. In other words it would be a value fund. Historically, the sweet spot has been in the bottom left hand corner: small value returns have outperformed the other spots on the grid. The one to avoid is the bottom right hand corner: small growth. Remember, just because small value funds have outperformed in the past, there’s no guarantee they won’t crash and burn in the future. Moreover, to earn that premium, small cap value investors have at times had to endure many years of beating themselves around the head as their small cap funds plunged the depths and trailed the market. Such is the price of reaching for higher returns. 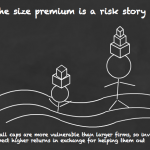 Although I’ve only discussed UK small caps so far, the same principles apply to any region’s small cap offerings. You can use this system to compare the small cap chops of active funds, too. Naturally, kicking the tyres like this doesn’t mean you’ll pick next year’s best performing fund. But it does mean you’re marrying up the academic evidence with publicly available data to give yourself a good shot of earning decent long-run returns. Global usually means developed world. The Dimensional funds don’t follow indices but use a passive methodology. Dimensional funds are only available through qualified IFAs. Equal weighted funds aren’t true small cap funds. Instead they overweight smaller companies in a broad market index because they invest equal amounts into every constituent stock, regardless of actual market capitalisation. The PowerShares index does not rank companies by market cap (as traditional indices do) but by fundamental metrics that give the ETF a value-ish tilt. The Aberforth Smaller Companies fund is an active product with a mandate to beat the Numis index. It also has a near identical (but slightly cheaper) investment trust twin. Note: All table data researched in July 2014. It’s easy to read the evidence for historical small cap and value returns and to feel a little giddy with excitement. Especially because these asset classes have performed extremely well over the last few years. Yet that very success has raised valuations well beyond their historical averages. That’s a situation which often portends a period of underperformance. Before you dive in, remember that investing in the return premiums is a long-term game that requires a steady hand and stout heart. The size premium – dead or alive? The snapshot cleared up some mysteries for me, thanks. I always lumped my HSBC FTSE 250 Index Fund in the same ‘bracket’ as my UK All Share funds, I just thought they were smaller companies (outside the FTSE 100) but not so small as to be considered ‘small cap’. I may have to look at readjusting my weightings. A potential fund to add to the list is DJSC: iShares EURO STOXX Small ETF. – quite a long historical record. – 0.4% still isn’t cheap. VCTs are huge companies: consider EISs. you won’t find a smaller cap than that outside of mothercare..
Hi. I’ve identified the Aberforth Small Companies Fund as the holding I’m after for small cap/value in my Hale-style portfolio. I’m confused as to whether to pick the fund or the Investment Trust (ASL). I’ve reviewed the Monevator posts about IT’s, and note this one is currently trading at approx 10% premium. Any advice about which one to pick would be much appreciated! @PassiveNoob — Aberforth Smaller Companies (ticker ASL) is currently trading at a discount of roughly 9-10%. There *may* be reasons for certain people to invest in VCTs and EISs, but those reasons typically come down to income, wealth, and tax. The former in particular are very expensive and have a poor record. The latter are risky, albeit with much of the risk mitigated by the tax breaks. IMHO they merit no further discussion on a page about passive investors getting exposure to mainstream smaller companies, please, as they’re a completely different sort of investment. Many thanks Investor for the clarification. Regarding your second post – a little over my head – but am I right I still have to choose between the Investment Trust (code:ASL) and the Fund (Aberforth UK Small Companies ACC – ISIN:GB0000072727)? Apologies if this is a stupid question. I continue to pore over every word on this marvellous site, but some things seem unwilling to sink in! My (Hale and Monevator inspired) portfolio consists primarily of globally cap-weighted funds (including emerging markets) plus tilts towards value and small cap. I use Vanguard funds for the tilts, which are imperfect for reasons you’ve covered but have low fees. Is there any advantage to using a combined value/small cap tracker like ASL for the tilt instead? Are the higher fees compensated by the more concentrated tilt, e.g. by allowing the tilt to comprise a smaller allocation within a portfolio or adding greater diversification/reducing risk? Any thoughts? Yes you can choose between them and clearly it is up to you which is the better choice. FWIW I have the investment trust and would still choose it. The holdings are generally virtually identical between the two, however the differences in what they potentially offer may influence your decision. The Unit trust can always be bought and sold at the asset value of its components where as with the IT the discount will inevitably fluctuate and if you wish to sell at any one time there may be a greater discount than when bought. This is a greater disadvantage at the moment when the discount is at the lower end of its historical range. However the advantages of the investment trust are 1) The charges are fractionally lower. 2) The yield is slightly higher, presumably because you are buying the assets at a discount. 3)There is a potential problem for Unit Trusts if in poor economic times the assets of the trust are illiquid as is potentially the case with smaller companies and unit holders are selling those who chose to keep the fund may find their assets falling disproportionately as the trust is forced to sell to maintain liquidity to pay those leaving the trust. @ L – thank you for the ETF tip, I’ll add that to the list when I get a mo. @ Rob – yes, you’d be taking on the greater risk of a small-value fund in the hope that over time the return will compensate for the fees. It may not work out of course, it’s a bird in the bush versus the bird in the hand you get with lower cost funds. @ Uncertain – are there any instances of that problem actually arising for Unit Trusts? Even so, if you don’t sell during the panic, it’s not a problem. Also, under the same circumstances, surely the discount widens for the Investment Trust and the effect is much the same? perhaps you could include the FTSE Fledgling Index in the list of indices (since it’s mentioned further down)? i take it that Dimensional funds are still unlikely to be available to investors not using a financial adviser? on european small-cap funds, 1 drawback of DJSC is that it only covers the eurozone. another option, covering all developed europe (including the UK), is PowerShares FTSE RAFI Europe Mid-Small UCITS ETF. this has a value slant (though TA has been sceptical about the “RAFIsh charms” of PowerShares generally). average market cap £1,560m. OCF 0.50%. Re: Unit trusts and forced selling, that was definitely an issue with some UK commercial property funds in the last downturn, including I think Unit Trusts. (Was New Star one? Can’t recall.) It was also an issue with those hedge funds who had holdings that became very hard to sell in the financial crisis. As redemptions from investors hit they had problems, and in both cases the open-ended nature of the funds caused more problems. (Some property funds solved it by locking investors money in for a period of time, some hedge funds did similar, but even those often only after flogging a lot of their most liquid stuff first — and of course later by winding down and disappearing from the record books). In principle it’s an issue, and it’s more likely to be an issue with small caps funds than with large cap company funds. Day-to-day, I don’t think it’d make any difference though, and I don’t recall it being an issue that’s mentioned much for mainstream small caps funds. But ITs do tend to outperform their open-ended peers, and while that’s usually put down to the ability to borrow and less money spent on marketing, this could be another factor? It’s most likely to make a difference at a time of crisis (as above) but at such times investment trust discounts will tend to blow out to, as TA says, so in the short-term it’d be horses for courses. I think the investment trust would have the edge though in that at least its portfolio wouldn’t be impacted, just their price, so in principle you/the managers could just wait for the market to come back, whereas the unit trust manager might need to nimbly rebuy positions sold for liquidity. This is one of those instances when a friendly fund manager’s two pence would be handy! 🙂 I’d ask Lars K, but his was a concentrated hedge fund (in terms of holdings and investors) and redemptions are a different ballgame altogether in that space. Does a global emerging markets tracker effectively cover small & value, since the companies in them are generally smaller than the developed market, and more volatile ? I do not know of individual instances with respect to small cap funds, but had read it was a problem following the crash in the 80’s. The problem is not the same with IT’s if you hold them through a down turn as the manager is not forced to sell holdings for redemptions which affects other unit holders. The problem of illiquid holdings in the Open ended form as pointed out above certainly caused problems for Property funds in the last fall. Terry Smith stated that liquidity was also the reason he launched his Emerging Markets fund as an Investment Trust rather than an open fund. I agree: it’s remarkable that they haven’t invented a simple and unambiguous way of reporting this simple and unambiguous concept. Re: Discounts, I know it may feel like a faff but I’d suggest you always check the RNS as I have above. Not only are fact sheets / data providers potentially confusing but they are also inconsistent (depending on how the treat debt for example) and I’ve seen data providers get it flat out wrong! Ideally with investment trusts you’d be digging into the accounts anyway. For instance I’d always look into how fees are charged against income or capital. I’d also always investigate the debt profile, and how much cash is reserved from previous years to smooth dividends. Time for an update or has little changed? Just revisiting this, as I have some money in an active UK small cap fund that I’m going to shift to passive. I’m wondering if the HSBC 250 index fund is the best choice. Yes, it has quite a high average market cap, but not much bigger than, say, the MSCI World Small Cap Index (the index used by the Vanguard Global Small Cap Index Fund). Perhaps a fund with smaller companies will capture more of the small cap premium, but they will have to deliver an extra 0.2-0.4%, just to compensate for their higher OCFs. I think I prefer to bank the savings from the lower OCF. Yep, there isn’t a good UK passive small cap option. 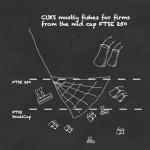 CUKS claims to be UK small cap but it’s got a large overlap with the FTSE 250 and a high fee at 0.58% last time I looked. I’ve got Vanguards FTSE 250 ETF at 0.1% but also Aberforth’s UK Small Companies IT. It’s an eye-watering 0.79% but is a small value fund – supposedly where the action is when it comes to the small cap and value premiums. The smaller you go, the more of the premium you’re likely to capture (they have micro cap funds in the US) but choices aren’t great in the UK. 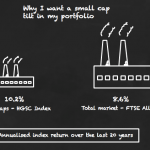 Which small cap fund do you use, out of interest? I was using Standard Life UK Smaller Companies. I noted the Aberforth UK Small Companies fund is paying a divi currently 2.4% unlike the unit trust. So 2.4% minus the AMC of 0.8% = 1.6% up. Am I missing something? @Jon — The dividend of an investment trust is declared after profits and tax (so the AMC will already have been accounted for). Tot up the annual dividends from last year (or what you believe the trust will pay this year) and divide by the share price to get the yield. Remember as you probably know that both dividends and of course the share price can fluctuate. I’ve just taken a look under the bonnet of my employee pension (Pru) and have been rather horrified at what i’ve found (high fees and 50% in a ‘dynamic growth’ fund with a max of 40% equities. Not what I need with 30 years before retirement. Anyway, one fund option available to me is the Prudential UK Smaller Companies S3 fund. It’s actively managed and targets UK companies outside the FTSE 350. The fees are 0.75% which seem comparable to Aberforth. There’s no mention of this fund in the above article but any views on it would be appreciated. I am looking for a global small cap fund or global ETF priced in £/pounds which is not so expensive. The vanguard small cap tracker is £240 per unit!!! Any ideas? The unit cost is irrelevant. The cost to you is summed up by the Ongoing Charge – in this case 0.38% per year. If you have £200 then you buy 1 unit of A and 2 units of B. Either way you’ve invested a total of £200. If both funds go up 10% then the value of your holding has gone up £20, regardless of whether you bought fund A or B. To answer your original question. The ETF alternative is the SPDR MSCI World Small Cap UCITS ETF. Last time I looked its Ongoing Charge was 0.45%. Previous post: Weekend reading: Are you weird enough to do well as an investor?